My name is Ryan, and I’m a father, husband, and incurable geek in Hawaii. In February 2005, I started a Hawaii-centric podcast called HawaiiUP. My wife, Jen, has a regular segment called The Pith of Pop (based on her review ‘blog of the same name), and we frequently devoted our chats to the hit ABC television series “Lost,” which is filmed in Hawaii and is, above all, a great, great show. Jen is a Florida native who chose to attend college in Hawaii on a lark. Ryan is a born-and-raised island boy. They met in the sleepy, rainy, Big Island town of Hilo, choosing “Schindler’s List” as their first date movie. 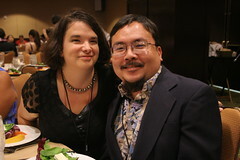 They’ve been together 15 years and have three gorgeous hapa kids. Many of the listeners of HawaiiUP confessed they liked Jen’s segments best of all. Several said they particularly liked our “LostCast” chats, while others wished we’d cover other things now and then. The solution, then, was obvious: an all-“Lost” podcast. After we watched the second season premiere a week earlier than the rest of the country on the beach in Waikiki, we knew “The Transmission” had to happen. If you’re familiar with podcasting, then you know that “The Transmission,” like most podcasts, is an amateur effort by people with no background in broadcasting and, to be honest, with sometimes very little of substance to say. In other words, you’re not going to find “Entertainment Tonight” or anything of that calibre (or with that degree of commercial slickness). Think of “The Transmission” as more of a friendly conversation among friends and fellow fans. The show, also, will evolve, and will hopefully grow with listener input and participation. Much of the fun of J.J. Abrams’ incredible drama is talking about it and musing over it with other people. So we hope a big part of “The Transmission” is… well, you. Who knows… maybe we’ll also be able to bring you on-the-spot reports and interviews, too! Finally, while this should be obvious, we should probably mention that (ahem) “The Transmission” is not affiliated with, or endorsed by, ABC, Touchtone Television, or Bad Robot Productions, nor linked in any official way to the creators and producers of the television show “Lost.” All trademarks used are properties of their respective owners. “The Transmission” is a purely fan-based, fan-focused production. And we would also like to thank the State of Hawaii and the Aloha spirit! Originally posted as “Genesis” in September 2005.